Muscle Bike Mania! Dad's sports car down to redline hotwheels, what was in the middle? Muscle bikes. 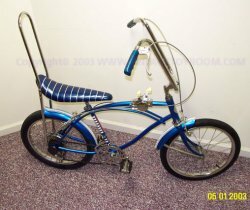 The 1960's created a whole new era of bicycles, many made by Huffy. This is a bit off from a typical toy, but hey, many of us looked at them and used them as much as toys. Here are 2 pretty cool Bikes That have passed through my hands. I wanted to show pictures to many of you who have followed me back in time with toys we had (or wanted) as kids. My apologies to the ladies, This is certainly a biased "boys toys" article, nothing personal. 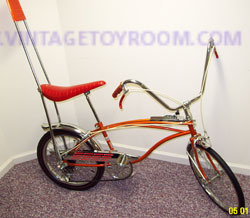 The urge for these cool bikes hit me when I was about 4-5. I would be heading out of Grants or Ames dept stores with my parents and like Emeril says... "BANG!" there they were, shining at me with chrome and bright paint. Huffy Rails lined up along the entrance ways and sidewalks of the stores. Deep candy apple red, bright orange, and even dark mettallic purple! I recall Sitting on these cool machines on the "banana seats", my feet could barely touch the ground, shifting that 5 speed like a race car! It was heaven to a 4 year old. I also recall my parents pulling me off saying I was too young for speed bikes. And handbreaks? I was told they were life threatning, dangerous, I would flip over the handle bars?, you name it. 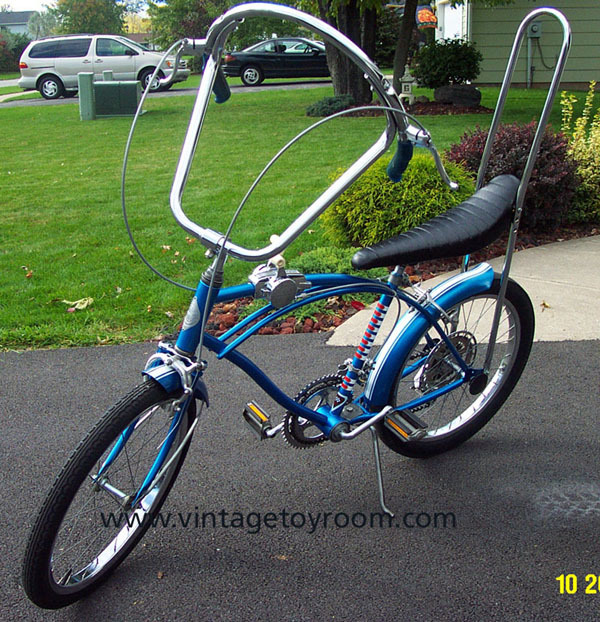 Huffy 5 Speed Slingshots(Small front 16" wheel), Rails (this bike), or "Stingrays"(actually a Schwinn Bike)were not going to be an option for me. I wonder now if it was a price thing?? They sold for $60-$70 in old catalogs I have since seen. I bet that was big bucks back in 68'. In fact, dept store bikes cost the same today! Well In 1973 3, 5, and 10 Speed Stick Shift Levers were banned. As a result, bicycles went to lame thumb shifters. At that time I was 6, starting with 20" bikes, but stock coaster bikes. Before you knew it I was old enough for 5 speed rails but the Shifters were long gone, so I cared less for 20" speed bikes. Quickly I bumped up to 24" English Racer 10 speeds. They became the standard as time went on in the mid 70's. Now the details. The orange bike is a 1969 Orange Mettalic Huffy Rail 5 Speed, was stored for over 30 years. . (I always confuse the terms, rail, stingray, and Slingshot?) It is a 20"X20" bike, Red line tires, slick tire in the rear, skinny 1 3/8ths front tire. I belive Stingrays had a 16" tire in the front? What I can say, Is I have seen several variations of this bike. Sears sold this in 1968 catalogs with 2-3 configurations. The bike has white line pedals, dark ORANGE mettallic paint! Huffy flaming stack chain guard, MINT matching seat, grips, lever covers and sissybar seat pad. All Original as it sat. This bike originated from the basement of a closed bike store. It looks pretty much correct to original. The sears 20" stick shift Spyders are pretty neat. many were made in 24" wheel size. This bike also sports the cheater slick tires, standard 20" front tire. Note how the older 10 speeds had no chain guard! I hope kids had these babies adjusted correctly! I can see pants getting caught in the chain, and chain coming off. I also have a 1/2 wheel style handlbar option. Click here to see the alternate handlebars. This was taken as I receved the bike. Note the seat was wrong, panted black. If you have any old 24" or 20" Stick Shifter bikes, let me know! I may consider taking it on a trade for items on this site. I really enjoy working on these wheels, they are pretty neat. I especially am looking for the Huffys and Schwinn Krate bikes. My email form is on the bottom of this page, let me know, I especially am looking for one in Dark Purple Mettallic Slingshot in Mint condition.